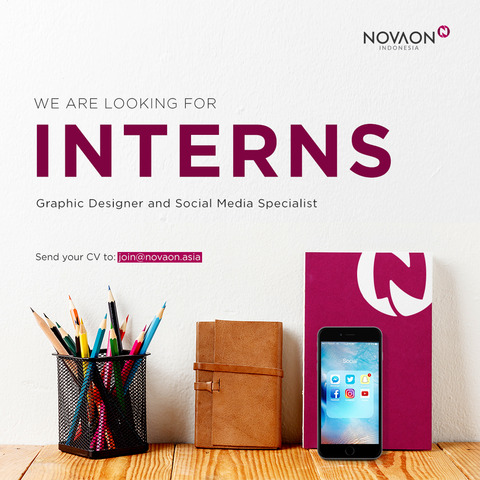 NOVAON INDONESIA is looking for a highly motivated, creative, and organized intern to assist the digital project team, with a particular emphasis on social media. This role will gains broad exposure to the entire company and is ideal for someone interested in both social media and digital strategist. Assist social media management platforms such as Facebook, Instagram and Twitter. This entails responding to customer inquiries, praises, complaints, and needs. Description NOVAON is Digital Marketing Agency that established in Vietnam since 2006 and start open Indonesia Office since 2016. We at NOVAON sticks our key aims towards “using Media and Technical development as a foundation to generate surplus value, creating successes for our company, clients, community, and for all members”. We understand thoroughly the magnificent strength of the Internet and have been working hard on adapting such strength for the benefits of humanity – help our partner develop their business conveniently and fruitfully. Being a core member of NOVAON Internet Corp that has been qualified by Google as a Premium partner i, NOVAON has been continously marked our brand as one of the leading companies in consulting and executing Digital Marketing campaign in Vietnam since 2006 and start expanding in South East Asia since 2015. We established Indonesia Office since 2016.